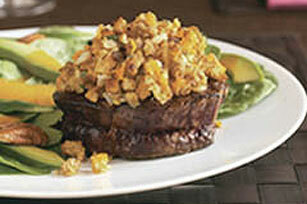 Here's a beautiful all-in-one presentation of tender, juicy steak and a savory stuffing side. The flavors marry together deliciously under the broiler. Heat ovenproof skillet on medium heat. Add meat; cook 6 min. on each side or until medium doneness (160ºF). Remove from skillet; cover to keep warm. Melt butter in same skillet on medium-high heat. Add zucchini and onions; cook and stir 2 min. or until crisp-tender. Transfer to large bowl; stir in stuffing mix and cheese. Add meat to skillet; top with stuffing mixture. Broil, 6 inches from heat source, 5 min. or until stuffing is lightly browned. Serve with a crisp mixed green salad tossed with your favorite KRAFT Light Dressing. If you are a blue cheese lover, substitute 1/4 cup ATHENOS Crumbled Blue Cheese for the 1/2 cup Cheddar.